Join us for Mardi Gras in Orlando, Steinhatchee, Sharon, PA, Buffalo, NY, and Upper Michigan. The Fish Market is a chain of seven restaurants in California and Arizona. They are actually markets where you can buy fresh seafood to cook at home, or you can sit and dine in the restaurant. This is a Cali style restaurant, with sushi, oysters, smoked and mesquite grilled fish, salads, and a selection of California wines. It’s not your down home, funky, best kept secret kind of place, however it is fresh, good quality seafood. Stop in the market after you chow down on Dungeness Crabs, and take home some Smoked Wild Alaskan King Salmon. For a more down home approach to the fish market/restaurant approach, try The Oyster Bar Seafood Shack in Blountstown, Florida. A welcome change from most fish houses, there’s no fried food. Everything is grilled, smoked, steamed, or raw. And the price difference is great. Instead of around $12 for six raw oysters in California, try $9 for a dozen in Florida. The Seafood Shack is truly a family operation. The mother in law of the owner makes the homemade desserts. OR…for the best kept secret in the Florida Keys, try the Shrimp Shack on Stock Island. The review of my friend, Ray’s place soon come. Don’t you think it’s time to just cook up a bunch of veggies for dinner. Man, that makes me feel all right! 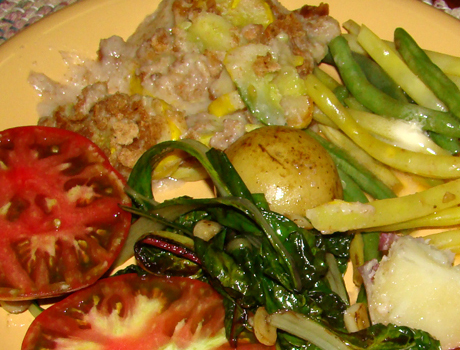 Here’s my veggie plate with chard, potatoes, squash casserole, fresh sliced tomatoes, and green beans. Yummm!